Thank you to the Centre County Gazette for publishing our Open House press release! Pick up their June 23-29 edition to check it out. 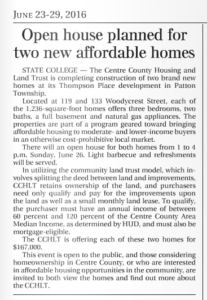 The Centre County Housing and Land Trust is completing construction of two brand new homes at its Thompson Place development in Patton Township. Located at 119 and 133 Woodycrest Street, each of the 1,236-square-foot homes offers three bedrooms, two baths, a full basement, and natural gas appliances. The properties are part of a program geared toward bringing affordable housing to moderate- and lower-income buyers in an otherwise cost-prohibitive local market. There will be an open house for both homes from 1 to 4 p.m. Sunday, June 26. Light barbecue and refreshments will be served. In utilizing the community land trust model, which involves splitting the deed between land and improvements, CCHLT retains ownership of the land, and purchasers need only qualify and pay for the improvements upon the land as well as a small monthly land lease. To qualify, the purchaser must have an annual income of between 60% and 120% of the Centre County Area Median Income, as determined by HUD, and must also be mortgage eligible. The CCHLT is offering each of these two homes for $167,000. This event is open to the public, and those consider homeownership in Centre County, or who are interested in affordable housing opportunities in the community, are all invited to both view the homes and find out more about the CCHLT. Check out photos from the event on Facebook. Thank you to Homes2Vu for giving their time & skills for the photos!